Depending on your point of view, content on the internet can be a vast collection of treasures, a cesspool swimming in filth, or a big pile of gold specks mixed in with an even bigger pile of dirt. My guess is that most people lean towards the last one, giving rise to content curation, the process of finding the gold among the dirt, as a very popular online activity. At its most basic, content curation is the process of finding, organizing, and presenting content from the flood of information and media that inundate the web by the second. Similar to museum curators, content curators sift through a seemingly never-ending amount of digital objects to unearth individual items worthy of being showcased for a specific audience. Once the selection is finished, the curator presents those assembled elements under a cohesive theme, just like museum curators do for specific exhibitions. Content curation isn’t about creating new content, just like a museum creator has no hand in creating the artifacts she decides to put on display. Instead, it’s about finding and organizing existing content for presentation under a meaningful context. It’s not about indiscriminately collecting content (that’s aggregation, like what an RSS reader does), either, just as a museum curator doesn’t simply point to any object in a warehouse when deciding which artifacts will be included for a particular show. Instead, curation entails making a critical evaluation of whether a piece of content fits into the context it’s going to be presented under. It helps to think of a content curator as someone who’s editing a print magazine. He gets 100 articles from his staff and 100 images from his photographers, all ready for publishing, except the magazine only has enough space to accommodate a quarter of that content. His task, then, is to sift through all 200 items and decide which ones will be published in order to serve the audience’s best interest. Except, in this case, the editor is dealing with the near-infinite amount of online content. As the internet has grown, so has the amount of original content it has made available to the world. While Google and other services have provided a way to sift through all this content to find the ones you need, it’s still easy to miss particularly good content when it’s buried under the heap of millions upon millions of search results (information on the web is expected to double every 72 hours just a few years from now). Content curation gives users another way to find the content they’re looking for. When someone curates content, they do the grunt work of sifting through those search results. A curator finds the content, checks them for relevance, and organizes their presentation, giving users a single, manually-vetted collection of valuable content in the subject matter they are interested in. There are no set limitations on the kind of content you can curate. If it’s out there in a public database or sitting in a server, it’s prime for consideration. It doesn’t matter whether it’s a blog article, a picture on Instagram, a video on Vimeo, a Yelp review, a PDF file, data from a Facebook page, a Google Maps snapshot, or a Tweet. If it’s relevant to the subject matter at hand, it’s worthy of being considered for inclusion in a curated collection. There are many ways content curation happens online. When someone creates a blog about Taylor Swift, then fills it up with video, pictures, and articles relevant to the singer, that’s content curation. When you create a summer video playlist on YouTube, it’s the same thing. Same goes when you create a Pinterest board for the best Halloween decorations on Amazon. Simply put, a lot of activities that happen online come about because content curation has become a necessary activity in an internet that’s grown too big for many individuals to process. Knowing how to properly curate content is a valuable skill. Do it right and you give the audience something they can find genuinely useful. Do it wrong and your curation serves to do nothing but add noise to the clutter of the internet. As you can probably tell, while you’re not actually creating original material, content creation can become a time-consuming, work-intensive process all the same. If you haven’t used content curation as part of your content marketing strategy, you could be missing out. Content curation sites and pages frequently attract audiences because they fulfill a very real need to skip through the clutter and find valuable content. People simply don’t have the time nor the patience to pore through pages of Google results, Twitter feeds, and Facebook messages in order to find the items that want. Content curation offers up a considerably faster and potentially useful avenue for discovery. When you curate content well, you can build up an audience of people who depend on your ability to point them towards the resources they need. You become an authority figure, a trusted source. And in the internet, that trust is invaluable. The biggest challenge of content curation is finding and identifying the right materials to include. While general tools like Google Search and Twitter’s search can help, going through those mediums still entails a time-consuming process that may or may not bear the fruits you’re looking for. The world needs an easier way to dig through the rubble and this need has given rise to a new generation of content curation tools. Social media has evolved into the hotbed of news. Simply put, we’re increasingly seeing breaking news come out of social media before any other sources. As such, it has become an important source for curators eager to find current and popular content, apart from its traditional value of getting first-hand comments from celebrities and other notable figures. Services in this vein include Nuzzel (a news service that draws from stories shared by your friends on Facebook and Twitter), Buzzsumo (which allows you to search the most viral stories on the web, based on its performance on Google Plus, Twitter, Facebook, and LinkedIn), and Tweeted Times (a personalized newspaper generated from your Twitter account in real-time), among many others. Turning curation into a social endeavor, these tools use the power of communities to curate content around the web. While these are great for users who curate for recreational purposes, they aren’t the most productive for content marketers and other professionals who curate content as part of their projects and campaigns. Services in this vein include Pinterest (social bookmarking), Flipboard (curate individual articles into theme-based web magazines), Spundge (curate content into notebooks you can publish on your website), and Listly (social list-making), among a whole load of others. For people more interested in using content curation as content marketing strategy, these services offer basic tools that can ease the process of finding content as well as presenting them. Storify – This browser-based tool lets you create stories that integrate existing elements from the web in a single interface, eliminating the need to jump from Facebook to Twitter to Instagram to YouTube. Basically, you can run a search from any supported website on the panel, get real-time results right on the same UI, and drag-and-drop the results you want onto the content you’re creating. It comes with a WordPress plugin for sharing “Storified” stories on your blog. Scoop.it – This service crawls and indexes over 10 million pages per day, so the database of content you’re drawing from is massive and ever-growing. A free membership will let you find content, curate it, and publish on you own Scoop.it page, but you’ll have to pony up a subscription if you want integration with your own websites and social channels, custom-branded content hubs, and analytics. CurationSoft – This Adobe Air app is a paid tool for finding content across 18 of the most popular websites (including Twitter, Facebook, Amazon, Instagram, eBay, Slideshare, and more), with support for adding RSS feeds of your favorite blogs. It comes with an integrated post builder, template builder, built-in browser, and automated post scheduling. RockTheDeadline – A complete interface for curating content from RSS, Twitter, and Facebook feeds, Rock the Deadline lets you pick out compelling content and promote them over multiple channels. If you’re a professional organization in need of enterprise-quality, end-to-end curation tools at scale, these software services are the ones to check out. Not only will they make it easier to find content and organize them, they integrate facilities for publishing, analytics, content management, and more. Trapit – A smart curation tool, it lets you set “traps,” a topical collection of content filtered by specific parameters. The system will then use its algorithm to present recommendations lifted from 100,000+ sources for inclusion in each trap, continually refining its results based on your preferences over time. Curata – A business-grade content creation software, Curata doesn’t just let you curate content from social networks, RSS feeds, and other sources from a single interface, it comes with a self-learning search engine that continuously trawls the internet, collecting content that are custom-tailored to your interests and past projects. The more you use it, the better the algorithm gets at finding content that suits you. It can integrate with numerous CMS software, social media channels, and marketing automation systems, complete with an API for integrating with other systems and metrics for analyzing your content marketing efforts. Kapost – A web-based software for managing a company’s entire content marketing operation, Kapost integrates Curata for its actual curation module. However, it goes beyond content curation, centralizing the management of everything that has to do with an organization’s content operation, including workflows, distribution, and more. Content curation is just a small piece of the company’s toolset, with highly customizable tools for social mapping, liveblogging, real-time commenting systems, and more (you can even build your own tool using their platform) available from the service. Waywire – A video-focused curation tool, Waywire lets you find, identify, curate, and share contextually relevant videos from hundreds of sources, including premium video providers like AOL, Yahoo, Conde Nast, and Wochit, as well as popular aggregators like YouTube, Daily Motion, and Vimeo. Much has been written about content curation on the web. Here are some of my favorites. 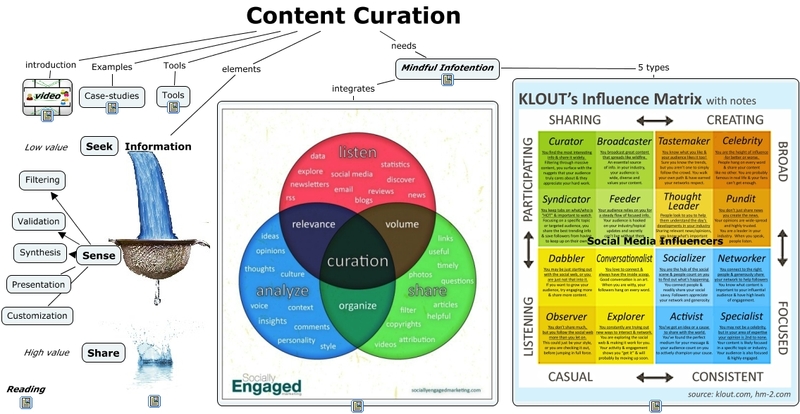 Content Curation Primer – This is an excellent introduction to content curation that boils it down to a three-step process (Seek, Sense, and Share), complete with a detailed discussion of all the various activities it involves. Buffer’s Content Curation Guide – This is a comprehensive post that covers content curation from start to finish, complete with tool recommendations for each step of the process and examples of how the tools are used in the company’s own curation workflow. Content Curation for SEO – This SlideShare from Scoop.it details the value and effects of content curation on a website’s SEO strategy using short explanations with plenty of pictures. It’s a light introduction to the potential benefits of integrating content curation into a website’s marketing strategy. Maximize Content Curation for SEO – Here’s a slightly more detailed take on how to curate content for SEO, complete with details on the kinds of curation that work and those that don’t. Key Tips for Content Curators – This post makes some valuable recommendations that content curators should be doing every time they put up a curated post on their blogs, websites, and social media accounts. Must-read for anyone considering using curated content as a regular part of their marketing efforts. Content Discovery Tools – This page is a comprehensive resource for the various content discovery tools around the web, whether it be breaking news, social comments, or web video. With the web growing bigger by the minute, good content curation is only going to rise in value. It’s already being integrated as a critical component in many content marketing and SEO strategies, with all evidence pointing towards its expanded use going forward. If you thought content curation was a fad, it’s definitely time to reconsider your position. What do you think? Have you had a go at curating a resource list? What type of curated posts have given you the most engagement? Leave your comments and suggestions below.